Bob Lefsetz writes a music industry newsletter that is regarded by many to be the one fresh breeze of rationality in the s***storm that is the current state of the business of music. One of the reasons that people read his blog, is that he often posts the responses of those that disagree with him, or elaborate on his points in a significant way. Bob Ezrin is an ascended jedi master record producer who has a perspective on creating music, and achieving success in the business, that I agree with and could not articulate as well. You can read a reprint from Bob L's newsletter below. (Click on the title link of this blog to go to the archives). I am often asked about how to make a song attractive to a certain market, or more often, what 'Radio', 'The Labels', 'A&R', managers, etc., are looking for. I've tried to counsel those who ask to create music for their 'inner fan' first and foremost. While I'm sure that there are musicians that create, very successfully, for a certain music market, I firmly believe that they are the exceptions that prove the rule. The playing field has become fairly level, at least at the present time. The tools to make a great sounding recording are ubiquitous and relatively inexpensive. The traditional means of marketing and distribution are in a shambles, and our newfound ability to share digital music, (legally or not), has left the experts scratching their heads as to how to make money on the fruits of our recording efforts. I have been preaching the gospel that Bob E. outlines below: 1) If your music is good enough, then an ever-increasing fan base will give you their money--even when they don't have to. 2) It's easy to tell if you are that good: more and more people come to see you live each time you play. They will call their friends and insist they come to your show (or buy your CD) with a passion that no clever marketing scheme could ever generate. If you even have to wonder if your performance or your music is that good, then you still have work to do. If you are like me, then the work is it's own reward. I love music, and consider it to be the highest, and most ubiquitous and accessible art form. I am invigorated and excited by the challenge of writing, arranging, recording, and performing the next song--always reaching deeper inside the creative process to extract the purest version of the tune. My goal is to create something that transcends genre, and will connect with as many listeners as possible, hopefully fulfilling a longing that they never knew that they had for your musical story, while at the same time igniting their craving for the next installment. Enough of my thoughts. Check out what Bob Ezrin has to say below. If you are like me, you'll be excited by his challenge to create excellence! I usually sit on the sidelines and eat my popcorn as I enjoy the theater that is you and this wonderful newsletter. You're better than most movies and just about any music that's out there right now for entertainment. And even when I think you're being a stick in the mud, you do it so artfully and passionately that it's ok and I enjoy the performance for its own sake. But this one has to be answered - with affection and the deepest respect of course. You start this with the word "Quality" and then you proceed to counsel struggling musicians to contort themselves and what they do to fit the market so that they can "make it in this business". But here's the true bottom line: This business of exploiting art and entertainment is built from it's very inception on creativity and quality, on special things made by special people that touch, inform, elevate, divert, soothe, numb, challenge or sometimes even drive other people enough so that they are drawn to it and want it to be a part of their lives - either for the moment or for a very long time. When they want it, they sometimes pay for it in one way or another and this special stuff sometimes accrues a value beyond the ephemeral and actual makes money for its creator and for the folks who help to support and market it. Sometimes it becomes more valuable than gold and stars are born. First, be special. Make something of such high quality that anyone would care. And that's not as easy as it sounds. Just because you can use a sequencer and play an instrument doesn't make you an artist. You have to create something that is special - unique and capable of moving others in a meaningful way. Once you are truly special, truly great at what you do, you may have a chance at finding an audience willing to reward you for your specialness. More than likely you will not, because special - by definition - belongs to the very few. But if you do, then someone somewhere might recognize that and show up to help you to take your creativity out to a wider audience. How do you get recognized in the first place? Play to people as much as you can. They will let you know if and when you are truly special because they will either begin to pay you to do this, to be able to be close to you - or they will ignore you. Play: in your town; at your school; in the next town over; on the web (but that's a whole other and longer discussion); at parties - anywhere you can. If you have created something truly special someone will recognize this and the ball will start rolling. But whatever you do, DO NOT pick a market and try to create for it. You may decide to do that later in life when you become so good at your craft that you can aim your creativity wherever you wish, even when it doesn't please you. But you cannot start there. No one is born a hack. Hacks are failed or jaded artists, each and every one. First you must be able to create for yourself and find the way in which you may be special, and then you have to work on becoming really great at that. Create from your heart and from your will. Your will is what you use to keep you practicing and trying and trying to get better at what you do. Your heart is where the inspiration comes from to use that ability to make something really truly special. But above all DO NOT listen to critics, pundits or "experts" who try to bend you to what is happening now. By the time you get there, now will be long gone. Dedicate yourself to quality, to being the very best at what you do and then use that quality to create or be something truly great. Then you may have a shot at "making it". But whether you become a star or not, you will have become and will forever be someone very special. And others will know you for that. 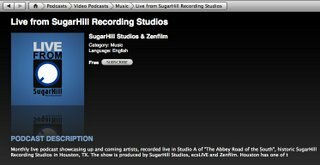 Live From SugarHill is now available as a subscription podcast on iTunes. It's also available on Vimeo. We're refining the show, and look forward to our next broadcast. We are going to incorporate some fun components into the show, as well as tweak the flow of the proceedings. The word from ecsLIVE is that login for the show should be GREATLY improved. We're still going to be audio-only for the February 5 broadcast, but the next show should be a full audio/video stream. For now, the video edit should be up in the week after the show. By the way, ALL of what you are hearing about LFSH is being generated and orchestrated by Ross Wells of zenfilm. This is no small task. Ross playes the web like a fine instrument. We could not have a better webmeister than Ross. "Thank you" doesn't cut it, but Thank YOU, Ross' does get us started.